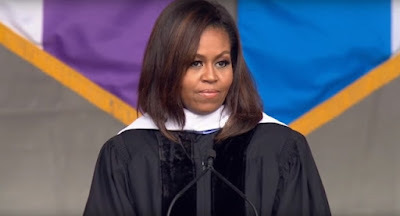 First Lady of the United States, Michelle Obama, delivered a powerful speech about the value of tolerance and diversity, in a commencement speech to City College of New York, a historically-diverse college dating back to 1847. Despite the lessons of our history and the truth of your experience here at City College, some folks out there today seem to have a very different perspective. They seem to view our diversity as a threat to be contained rather than as a resource to be tapped. They tell us to be afraid of those who are different, to be suspicious of those with whom we disagree. They act as if name-calling is an acceptable substitute for thoughtful debate, as if anger and intolerance should be our default state rather than the optimism and openness that have always been the engine of our progress. I can tell you, as First Lady, I have had the privilege of travelling around the world and visiting dozens of different countries, and I have seen what happens when ideas like these take hold. I have seen how leaders who rule by intimidation, leaders who demonise and dehumanize entire groups of people, often do so because they have nothing else to offer. And I have seen how places that stifle the voices and dismiss the potential of their citizens are diminished; how they are less vital, less hopeful, less free. Graduates, that is not who we are. That is not what this country stands for. Here in America, we don’t let our differences tear us apart. Not here. Because we know that our greatness comes when we appreciate each other’s strengths, when we learn from each other, when we lean on each other. Because in this country, it’s never been each person for themselves. No, we’re all in this together. We always have been. Here in America, we don’t give in to our fears. We don’t build up walls to keep people out because we know that our greatness has always depended on contributions from people who were born elsewhere but sought out this country and made it their home – from innovations like Google and eBay to inventions like the artificial heart, the telephone, even the blue jeans; to beloved patriotic songs like ‘God Bless America’, like national landmarks like the Brooklyn Bridge and, yes, the White House – both of which were designed by architects who were immigrants.